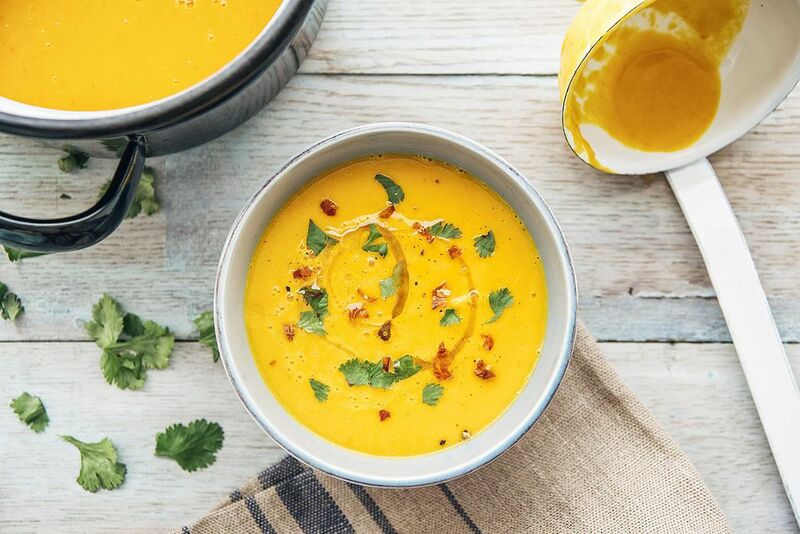 Top this delicious quick pumpkin soup with a bit of purchased (or homemade) pesto or some roasted corn kernels and Parmesan cheese. It's rich, creamy, warming, and delicious. And so easy to make. It's important to use canned solid pack pumpkin in this recipe; don't buy pumpkin pie filling. The pie filling has sweeteners, milk, and other ingredients added that will make the soup too sweet with a strange texture. Solid pack pumpkin is made just from the pumpkin. Read the label before you buy. You can make this recipe with canned or boxed chicken broth or stock. We prefer to use the boxed version since it is of higher quality than canned. Of course, your own homemade chicken stock is best, but not everyone has some on hand. And you can certainly add more ingredients if you'd like. We think some chopped garlic would be good in this soup, as would some sliced carrots or zucchini. It is meant to be a simple soup, so don't dress it up too much. This soup is delicate and flavored with thyme. You can use other dried herbs if you'd like. Marjoram or basil would be good with the pumpkin and corn. We think oregano and tarragon are too strong for this soup; you really want the flavors of the broth and pumpkin to come through. Serve this soup topped with pesto and some freshly grated Parmesan cheese. It's a delicious first course served in small bowls or cups, or can be the main part of a meal when served with a green salad, some toasted garlic bread or hot rolls, and some braised carrots or steamed asparagus. For dessert, choose a simple lemon pie or some brownies. Combine the chicken broth, corn, and onion in ​a large saucepan and bring to a boil over high heat. Reduce heat to low and cover the pan. Simmer for 12 to 15 minutes until onion is tender. Stir in the pumpkin spoonful by spoonful and blend well using a wire whisk until the pumpkin is combined with the liquid in the soup. Cover the pan and simmer 5 to 10 minutes longer. Then add the half and half, salt, pepper, and thyme; stir well. Heat for 2 to 3 minutes until steaming but do not boil again.